I’ll keep the preamble to a minimum. The books are listed in the order I read them. More detailed posts can be found here. Favorite novels that were new to me in 2009: The Red Right Hand, Joel Townsley Rogers (1945) and Adios, Scheherazade, Donald E. Westlake (1970). Again, a thousand thanks to Duane Swierczynski for introducing me to the latter. And finally, the best book I read in 2009 regardless of genre or year of publication is Moneyball: The Art of Winning an Unfair Game, by Michael Lewis (2003). I’ll go you one better. This book – about economics, business, mathematics, baseball and life – goes on the short list of the greatest books I’ve ever read, along with Dino, Nick Tosches’ biography of Dean Martin, and The Hardy Boys Detective Handbook. Illustrious company indeed. 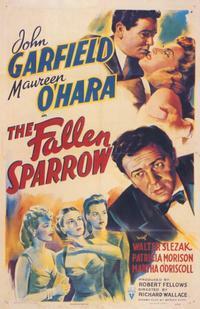 The last John Garfield post started an interesting exchange with fine novelist/friend of the site Ed Gorman. 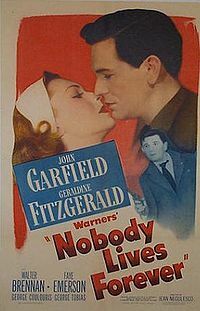 Ed suggested that Garfield’s persona might not have worn as well as other noir stars because it can’t be easily reduced. Think of Robert Ryan and you think of that peculiar combination of rage and sorrow. Dana Andrews is melancholy. Bogart is coolness under pressure. Lee Marvin is menace. As usual, Ed’s onto something. Garfield’s mercurial presence was used well in a number of strong films – The Postman Always Rings Twice, Body and Soul, Force of Evil – but not one that you could point to and say, “That is John Garfield.” Plus there’s something boyish about him. Ryan, Bogart, Marvin – these are men, fully grown and set in their ways. Garfield still seemed malleable. I meant it when I said Garfield cast a long shadow, because in an era with far too few men onscreen, Garfield is the best model we’ve got. His youthful energy allowed him to play a role he was too old for in what would be his final film, He Ran All The Way. He’s a smalltime, slow-witted criminal still living with his mother (the pitiless Gladys George). 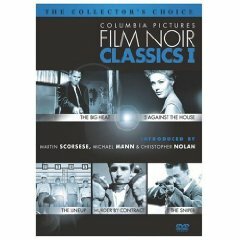 After panicking during a payroll heist and killing a police officer, he picks up Shelley Winters, goes home with her, and takes her family hostage. The movie is a forerunner of the home invasion genre that took root during the post-war suburban boom. Like other films of the type, there are moments that strain credulity. (“Rush him now! Take the gun!”) But it’s also charged with an uncommon mood of paranoia, even doom. Director John Berry and cinematographer James Wong Howe keep the camera uncomfortably close to Garfield’s desperate face, using scenery to trap him in the frame. The actor takes care of the rest, right up to the closing shot. 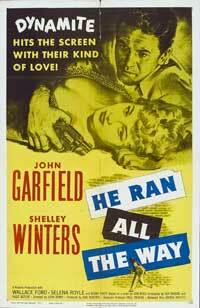 It’s our last image of John Garfield. He died of a heart attack at age 39, haunted by charges of being a Communist sympathizer. 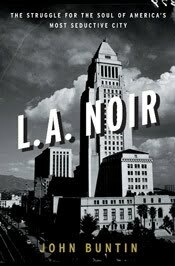 The latest issue of the Film Noir Foundation’s Noir City Sentinel includes a terrific article by Jake Hinkson that looks at He Ran All The Way as a blacklist case study. You can read it online now. Looks like I’ll be seeing He Ran All The Way again shortly, the way it was meant to be seen. 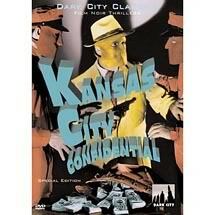 The schedule for 2010’s Noir City Northwest is up. Eddie Muller’s dark carnival hits SIFF Cinema after its run in San Francisco. This year’s theme is Lust & Larceny. It’s a doozy of a line-up. I’ve seen six of the fourteen films before, only one of them (Pitfall) on the big screen. I’m eager to catch the newly restored print of the crackling Cry Danger, while Rosemarie can’t wait for the aptly titled Larceny, starring John Payne and Dan Duryea as dandy grifters. Come that week in February you know where I’ll be, endeavoring to bring you the coverage you’ve come to expect. Other websites may be offering lists of 2009’s finest1, but around here we’re more forward thinking. Permit me instead to tease you with a word about one of the best books you’ll read next year2. 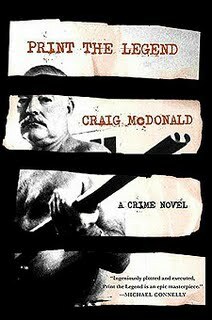 Print the Legend is the third novel by Craig McDonald featuring Hector Lassiter, the man who lives what he writes and writes what he lives. And it’s a full-on tour de force. Hec’s longtime friend Ernest Hemingway is four years in the ground when Hec consents to address an Idaho conference devoted to Papa’s life and work. But Hec’s got more to reckon with than a speech. There are his own unsettled feelings about his compatriot. And the dogged efforts of a scholar intent on proving that Hemingway’s suicide was in fact a coldblooded murder committed by Papa’s wife Mary – a theory that Hec can’t easily dismiss. Plus Hec’s burgeoning affection for said scholar’s pregnant wife. Not to mention Mary Hemingway’s own plans for Papa’s legacy and Hec’s role in it. And above all, the twisted machinations of Donovan Creedy, the hack novelist, government operative and dirty tricks specialist with shades of E. Howard Hunt. Not many authors would dare to write a missing chapter from Hem’s A Moveable Feast. Fewer would pull it off as McDonald does here. He then follows up with a beautifully structured section jumping between the POVs of his five major characters at a single treacherous meeting. Late in the book there’s an extended description of let’s say physical courage that Papa himself would approve of. Me, I went pale just reading it. Print the Legend moves with the intensity of a fever dream, driven by Hec’s zeal for life. If the book has a weakness, it’s the notion that Creedy’s abstract plan has a hope in hell against the force of nature that is Hector Lassiter. Why am I tormenting you with praise for a book that doesn’t come out until February? 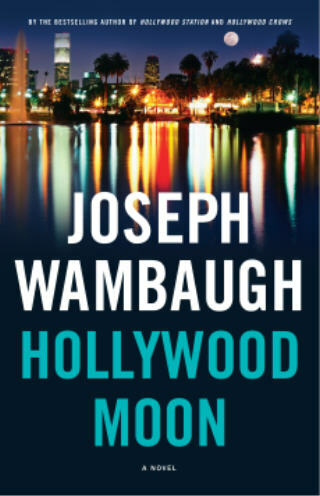 Because McDonald offers a few tantalizing hints of the next book in the series, set in 1958 Nashville, and that’s at least another year away. It’s only fair that we all suffer together. 1Don’t worry. Such a post is coming. 2Yeah, FTC, I got a review copy. Whatcha gonna do about it? 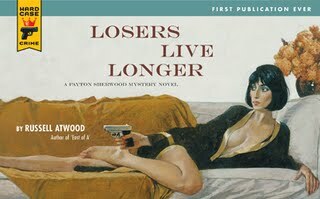 I’ve read quite a few books by Ed Gorman, but somehow the Sam McCain series got by me. So naturally I’m starting with the newest entry, which is also possibly the last. Still, better late than never. Sam is a lawyer/investigator in Black River Falls, Iowa. It’s 1965. The local minister is burning Beatles records and people are starting to pay attention to the conflict in Vietnam. Some, like Sam, are doing more. They’re organizing protests, incurring the wrath of more conservative friends and neighbors. Shortly after one such rally goes awry, there’s a murder. As far as the sheriff is concerned it’s tied to the demonstration, but Sam unearths connections to a death that rocked the town several years before. It’s a Gorman novel, so you get a well-turned plot, deft pop culture references, and sharp observations on small town life. You also get characters who don’t conform to expectations. The golden boy activist railroaded into jail? He’s something of an operator. The die-hard patriot ready to tar and feather is also a grieving father. Then there’s Sam himself, aware of all these incongruities as he struggles to do the right thing. 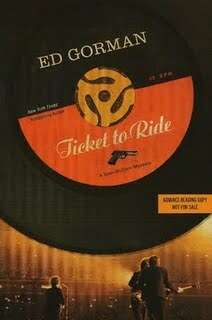 Here’s Ed in conversation with Tom Piccirilli about Ticket to Ride, the earlier Sam McCain books, and other sundry matters.